After two weekend-long video-editing sessions we finally went live with the new online training course anticipating the Da Vinci Code film opening next week on the 19th. It’s called “Da Vinci Code Conversations,” and it’s intended to give viewers a brief, birds-eye-view of the major contentions in Dan Brown’s novel and — presumably — the film. Emperor Constantine was a lifelong pagan who fabricated Christ’s divinity at the Council of Nicaea in order to further his political ambition. Virtually everybody knew Christ was a mere mortal until Constantine cooked up this divinity myth at Nicaea. Christ was married to Mary Magdalene, and had children by her, who survived him to found the Merovingian dynasty. Somehow, this mere mortal understood he was creating a worldwide church, and therefore intended his wife, Mary Magdalene, to be its founder. That the Priory of Sion is an ancient secret order devoted to protecting the evidence for the truth behind the myth at any cost. That the Opus Dei Catholic order is a bunch of crazed zealots. The course addresses each of these issues briefly, but with enough depth that anyone taking the course would have enough fodder to manage a conversation about the issues with after-film dinner guests. Plus there are the additional materials provided with the course, including a recommended resources list, that will help the viewer delve even deeper, if one cares to. 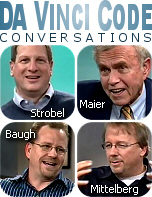 Here’s the “Da Vinci Code Conversations” homepage promotion. Here are the sample videos, at high bandwidth (311kbps) and low bandwidth (56kbps). As usual, enjoy! Regular posting will resume again, shortly. having loaned a friend at school a couple of my books, I felt a bit “obliged” when she then insisted I read The Da Vinci Code. I would recommend it to no one, the language in it being too strong for my fancy. Other than that bit of acknowledgement, however, I found it to be no more than an attempt to utilize the Gospel as a background for an Indiana Jones vehicle. It does not surprise me that the Church world, in general, is upset; but it does give me cause to shake my head and wonder when some find it offensive to the Church as an institution and not as an insult to the facts of Christ. Personally, I find it just another bit of humanity in its natural state. If people don’t want to see it, don’t buy tickets. If my faith was so fragile that it could be shaken by some Hollywood piece of admitted fiction, I didn’t have much in the first place. Then, again, maybe I’m not getting the “whole picture”……. I can’t wait until this blasphemes movie and book has had its’ 15 minutes and dies in its deceit.